Taking the fun with you is a great advantage of inflatable boats and small fishing boats. Mercury offers a complete line of portable FourStroke outboards that are extremely light, with the widest range of models to choose from. The entire line makes operation and portability easy with smart, simple features. Plus, clean, quiet, fuel-efficient FourStroke performance makes them the obvious power of choice. POWER & PERFORMANCE: Everything from reliable, instant starts and clean, quiet operation to flawless performance under almost any condition makes Mercury mid-range engines a perfect fit for your boat. No stone was left unturned in our search for excellence, and the resulting engines deliver the reliable, responsive power you need, along with the fuel-efficient performance that has made Mercury FourStrokes the world's best-selling mid-range four-strokes. BORN TO BE SMOOTH: All portable and mid-range Mercury FourStrokes feature INLINE DESIGNS for inherently smooth operation. QUIET BY DESIGN: The INTEGRATED IDLE RELIEF ATTENUATOR, ENGINEERED AIR INTAKES and ACOUSTIC FOAM make our 75 - 115 horsepower FourStrokes nearly silent at idle. EASY SHIFTING: PRECISION ENGINEERED SHIFT system delivers smooth shifting for an improved driving experience. CLEAN POWER: All Mercury FourStrokes are designed to run clean, helping to protect the environment for generations to come. Every Mercury mid-range FourStroke engine carries a CARB THREE-STAR ULTRA-LOW EMISSIONS RATING. CONSISTENT STARTING: Mercury FourStroke EFI outboards deliver consistent, easy starts, smooth operation and reliability. The 25 and 30 hp models are the industry's first batteryless EFI outboards. RELIABILITY & DURABILITY: Delivering peace of mind is a leading priority with Mercury FourStrokes. From the first time you turn the key to your hundredth fishing trip and beyond, you can count on them to perform. The advanced technology, durable components, smart features and unmatched warranty combine to provide the engine security you need today and in the years to come. 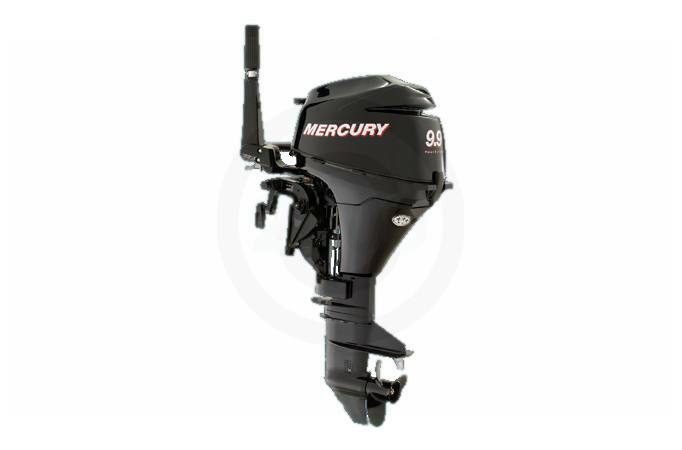 INDUSTRY-LEADING WARRANTY: Every Mercury outboard comes with a three-year limited factory-backed, nondeclining warranty (except Mercury Racing models). SMART ENGINES MEAN MORE FUN: The ECM (Electronic Control Module), with its advanced microprocessor, is the brain of the Mercury FourStroke engine. It controls engine functions such as idle speed, starting and smooth performance and alerts you to potential problems. SUPERIOR CORROSION PROTECTION: Mercury FourStrokes deliver powerful saltwater protection by using more stainless steel components, hard anodizing, engineered polymers and exclusive multistep painting and coating processes. Saltwater maintenance is made easy in the 40 – 115 hp models with the innovative freshwater flushing water. And… only Mercury offers a three-year limited corrosion failure warranty. PEACE OF MIND: Engine Guardian uses more than 40 sensors to monitor functions of your engine. If the proactive operator-warning system detects a potential problem – such as overreving, overheating or low oil pressure – Engine Guardian sends out an alert and automatically reduces engine power to prevent damage.